Always with a focus on streamlining function to its essence without compromising performance, Arc’teryx optimized the Sabre Jacket with features to handle the vertical aspects of big mountaint skiing. The helmet compatible StormHood(tm) cinches securely, providing full coverage with exceptional visibility. Rapid ventilation on traverses and ascents come from WaterTight™ pit zips, and the integrated powder skirt is created to deliver a secure fit in deep powder. Pockets are designed and placed to provide security and accessibility, even with a pack on. The streamlined WaterTight™ Vislon zipper in the front seals tight. Sabre Jacket - Mens is rated 4.5 out of 5 by 18. Rated 5 out of 5 by ericb from Incredible product This product truly impressed me. It is incredibly light and waterproof. I live in California, so when it snow it is normally wet, and the jacket kept me dry all day. When it was almost soaked through, I would simply go inside and it would be dry in 10 minutes. I also have the Sabre pants and the pair go together quite well with the snaps on the jacket and pants. When you put on the jacket it feels as if you are wearing nothing. I liked the minimalist design of only 3 pockets. I could store anything in the pockets, they would even fit climbing skins! Overall I highly recommend this product to anyone. Rated 5 out of 5 by cjtst11 from Great jacket! First, I am 6'0", 185lbs and a medium fits very well. Not too big but certainly large enough to layer adequately with down or fleece. The sleeve length is also spot on for me (I wear about a 34in sleeve). Construction detail is flawless and I love the feel of the new soft shell material. The interior "flannel" lining is very thin, not sure how much insulation it really provides but it definitely feels good to wear, not clammy at all. The hood is very large to accomodate a helmet but lays down fairly well when not in use. Overall, this seems like it will be a great coat for both skiing and three season East coast foul weather wear. Rated 5 out of 5 by chrism from Awesome This is my first Arcteryx Jacket and so far has been unreal. I paired it with the Atom AR midlayer. I went on a day when it was 6 degrees and was perfectly warm. The fit is perfect for the snowboarder look at a baggier jacket, not the typical Arcteryx trim fit that is inherent in a lot of their designs. Overall, the Blue Moon color is really nice. Very durable 3L Pro Shell, especially with the gore fabric with a softer face. I ordered the Rush and Sidewinder to compare (of course returned them), YOU WILL NOT BE DISAPPOINTED. Rated 5 out of 5 by Itsme78932 from My go to shell This is an amazing shell. The soft shell goretex is very comfortable wearing on bare skin. It has a very soft almost fleece like lining, super thin. Ive worn this jacket into the mid to upper 70° weather during rainstorms, and provided awesome protection. I consider this my 4 season jacket, layer underneath for winter. Plenty of pockets for me, lots of adjustability in everything from the hook, hem, and even the powder skirt. I have this jacket in squid ink, and i really like the color. Sticks out and is unique, i get many comments on it. Overall, extremely happy with my purchase. Rated 2 out of 5 by Harry from Initially quite impressed I purchased this jacket last season. It was my second Arcteryx purchase; I had bought the Sabre pant previously. The first thing that I noticed was the gorgeous construction of the surface material. It looks very luxurious. My first day out with the jacket was a wet one and the jacket came through like a champ. It beaded water and the water just rolled right over the surface. Fast forward to this year. After laundering the jacket a couple of times, following exactly the manufacturer's instructions, I have a completely different jacket. It no longer beads water, even a little bit. Water soaks directly into the material. I do not think it leaks but it definitely no longer transports water at anywhere near the same level as new, this after less than a season, 15-20 days. The appearance of the face material has suffered similarly. It appears faded and no longer has that pop which initially attracted me. 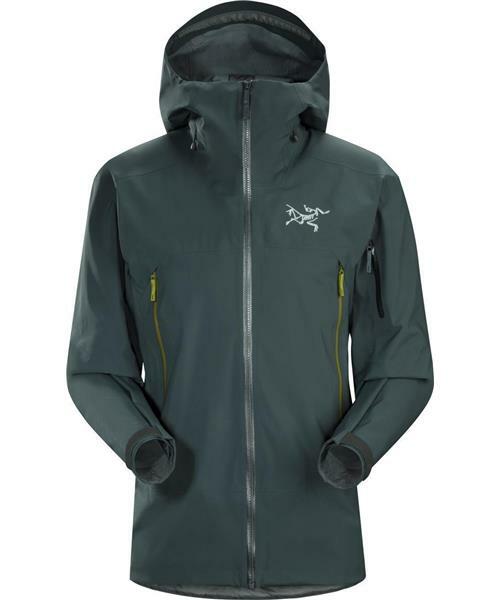 I own a large array of Arcteryx products including the Rush jacket, Caden gloves, Atom Lt jacket, Lorium hooded jacket, Stinger bib, etc. on and on. Almost to an item these have all met or exceeded my expectations in terms of looks and performance. Not so the Sabre. Rated 5 out of 5 by Robb from This is an outstanding jacket! I recently got my Sabre SV and from the start I was impressed. The large fits a bit baggy for me, though I am fine with the freestyle look of the jacket (I am 6'4, 200lbs if you were wondering). The style of the jacket is simple but sleek, providing perfect comfort and complete water-resistancy. It offers great movement for the hills and superb comfort for everyday use. The carbon copy colouring that I bought is also perfect, as it is not black, not grey, so almost nobody has the same colour of coat! Rated 4 out of 5 by Nick from Excellent Ski Jacket The Sabre Line runs a bit bulky for my liking. I know this is the style right now, but I prefer a slimmer fit which I am accustomed to from most of my Arc'teryx products. I am 6'3" and 195 lbs and decided to go with a medium. That being said, this jacket is a top notch product. The GORE-TEX is exactly what we have come to expect from Arc'teryx and will stand the test of many years of abuse. The zippers work well and I my only reason for a 4-star rating is main zipper is not completely waterproof or it is at least not as seal proof as the zippers on Arc'teryx products I have come to expect. This is usually is not needed, but in the Northwest we have wetter snow and it is a risk to hike in the backcountry with a less than waterproof zipper. Overall, for a skiing day anywhere, this jacket will be my go to top layer.